Hi all… sorry if this weeks a bit short and sweet, since we are in the process of potentially buying an apartment. Wheee!! But also time and slightly soul consuming. So, I whipped this up for dinner last night, just served with some spiced pork chops cooked simply. This is a nice little salad to replace a traditional coleslaw- after all, cabbage is pretty notoriously hard on baby’s digestive system. I love daikon radish and it seems to be a solid substitute flavor wise for cabbage, so here’s something a little spicy and a little sweet that you can eat guilt free. I cut everything up into large matchstick size pieces- it keeps things crunchier than if you shave the ingredients, which means the salad also keeps better overnight. 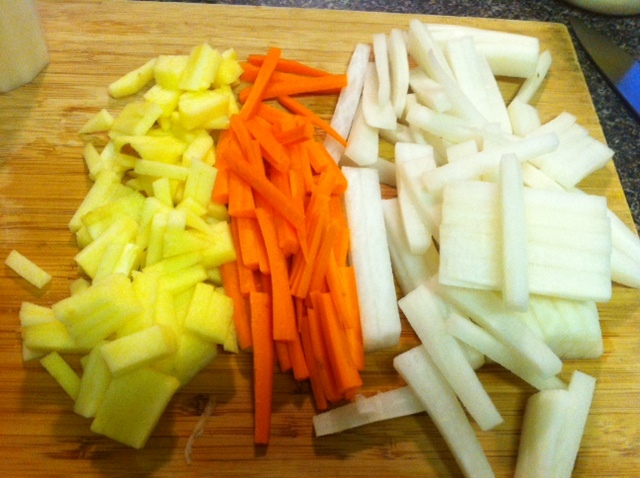 I cut the carrots and apple a bit smaller than the daikon, as you can see in the picture. This is because daikon has more of a tendency to get floppy and sad if it’s cut too thin, and I like my salad to have a good crunch. Also, I wanted to distribute the carrot and apple more evenly, so you get little hits of sweetness instead of one big chunk. If you are feeling ambitious, you can make the mayo, but since it has unpasteurized, raw, egg yolk, I keep it easy and safe by just using Hellmans. It’s dairy free, though it does have soy. 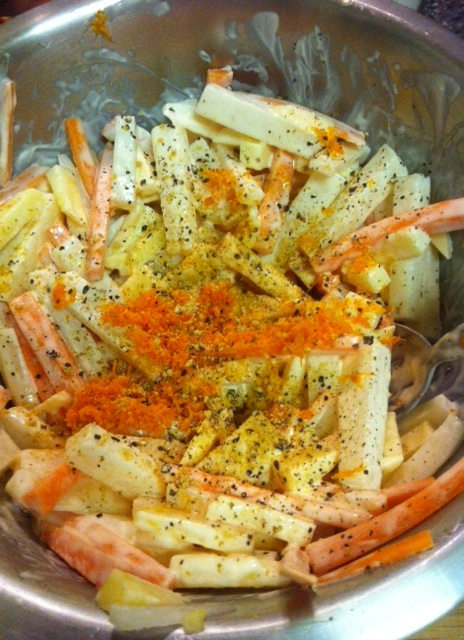 Combine the vegetables, lemon juice and zest, mayo, and spices, and toss together until thoroughly combined. 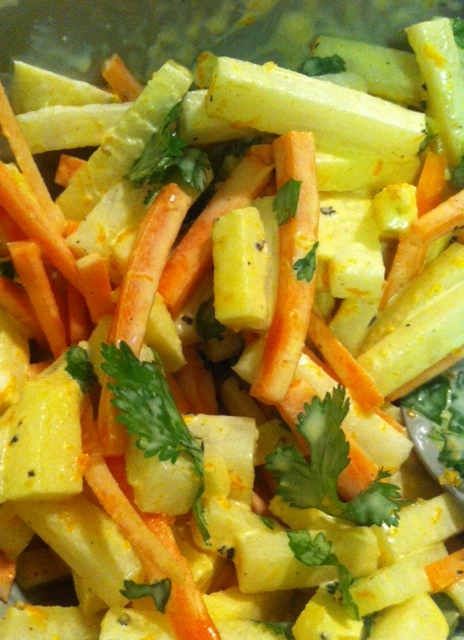 Finish with the cilantro, and serve.